As Morocco’s largest city and business center, Casablanca suffers from infernal traffic congestion, related air pollution and insufficient public transit. The municipal government has yet to realize longstanding plans for a subway system, but has recently completed a $1.6 billion tramway that connects much of the city’s east and west sections via the center. Such lines are becoming a global trend, promoted as environmentally sustainable and socially equitable urban renewal. The 31-kilometer system was inaugurated on December 12, 2012, featuring shiny new Citadis trams built by French transport giant Alstom. 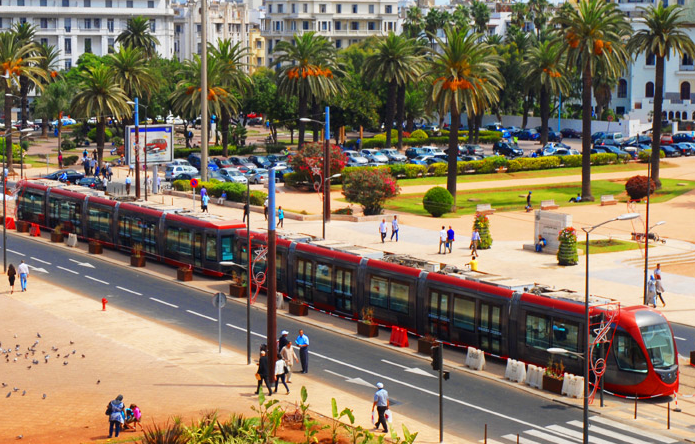 It is similar to the light-rail model recently implemented in Morocco’s capital, Rabat. 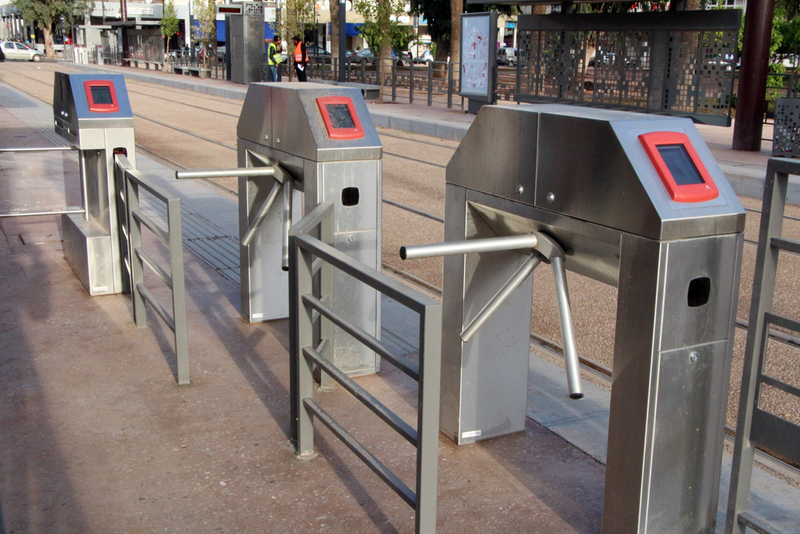 Access to the tramway in Rabat is available at clearly marked stations with an open platform. 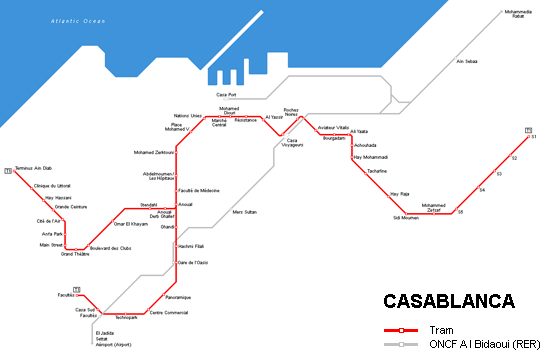 Casablanca’s tramway network has 48 stations with separate exits and entrances accessible through turnstiles. Telquel, a popular Moroccan weekly magazine, dedicated a feature to the security force working on the Casablanca tramway. While riders in Rabat can travel across the city without seeing a transport employee, their presence on the Casablanca tramway is remarkably high. Each station has five to seven employees, whose responsibilities range from maintaining order and safety to helping with ticket purchase and validation. Two attendants signal the arrival of tram cars with whistles, a measure aimed at helping people adjust to their presence in the streets. 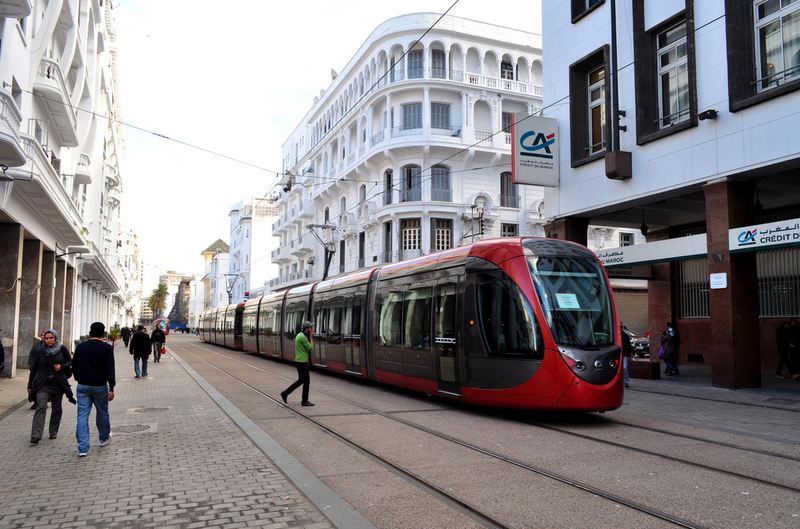 Casablanca’s tramway has become highly popular in the two months since its inauguration. There have been an estimated 1.2 million passengers to date, although officials say they’ve yet to reach the targeted volume of 250,000 per day. The introduction of 37 new trams, along with monthly passes, should bring this target quickly within reach. For the moment, the city’s plans to substantially reduce traffic problems remain unfulfilled. Those who commute to work by car tend to live outside the areas served by the tramway, which currently links Casablanca’s working-class neighborhoods of Sidi Moumen and Hay Mohammadi with the main university campus and the luxury beachfront neighborhood of Ain Diab. However, transit authorities intend to add another four lines to the network, as well as an express-rail line (RER), to connect the sprawling suburbs in the northeast with the airport, commercial sectors and technology hubs in the southwest. Could bridging spatial gaps between the periphery and the center help bridge opportunity gaps between those living in the shanties of Sidi Moumen and those sipping cocktails in the beachfront bars of Ain Diab? If so, it would be a sign of the potential in transportation planning for reducing urban poverty. Thank you for this great overview and very important closing question. It sounds like Casablanca planners are actually trying to connect poor residents with employment opportunities, which could only help reduce poverty. At the same time, neighborhoods with tramway access usually experience gentrification, and low-income residents end up in a more isolated location. The Third Street Light Rail in San Francisco might be a good case study. Is it forcing longstanding residents of the Bayview and Hunters Point neighborhoods out of their homes or have planners found progressive ways to avoid this?